I spent most of week 4 up in Sheffield enjoying a (sort-of) week off, hence the new background wall! Yes, it’s yet again more of the same, but nice to know that I can even put together a good travelling wardrobe for a week away of varied activities from my samples. 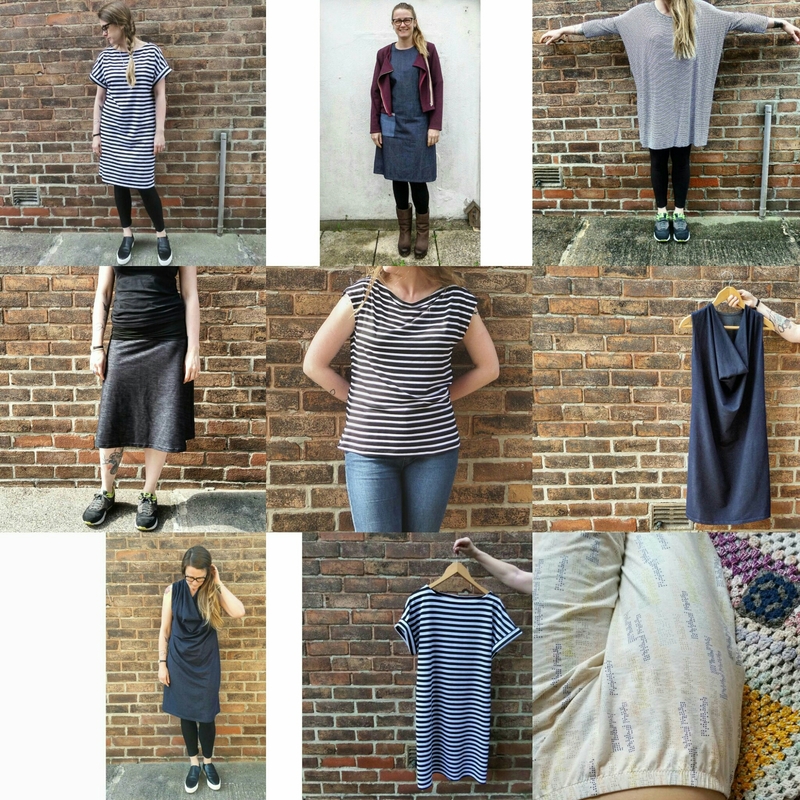 sample of the new t-shirt pattern in development, this time as a stripey dress in viscose jersey and my own pattern leggings (used in my Make Your Own Leggings classes and available to use in weekly classes at MIY Workshop). the same Wisewood dress worn for another night out! cosy pyjama trousers in Art Gallery fabrics super soft cotton jersey (the pattern is used in my Make Pyjama Trousers classes and is available to use in weekly classes at MIY Workshop). I need to make more one piece Fulwood dresses; so comfortable, so versatile. I have some gorgeous quality ponte roma languishing in MIY Workshop so maybe I’ll chop into that. I’m such a neat freak that I like the consistency of a similar backdrop. Trying to get my dad to hold a camera straight tested my patience to its absolute limits….sorry dad!! I had a much better week of documenting my daily wearing of Me Mades this week and am mostly managing to stick to my pledge (hooray, pat on the back for me) and I’m really enjoying it! My realisation after week 1 that I didn’t wear much colour or many prints hasn’t really altered, that’s obviously just what I like to wear. I obviously subconsciously made an effort though and broke up the grey, black and blue with some stripes! 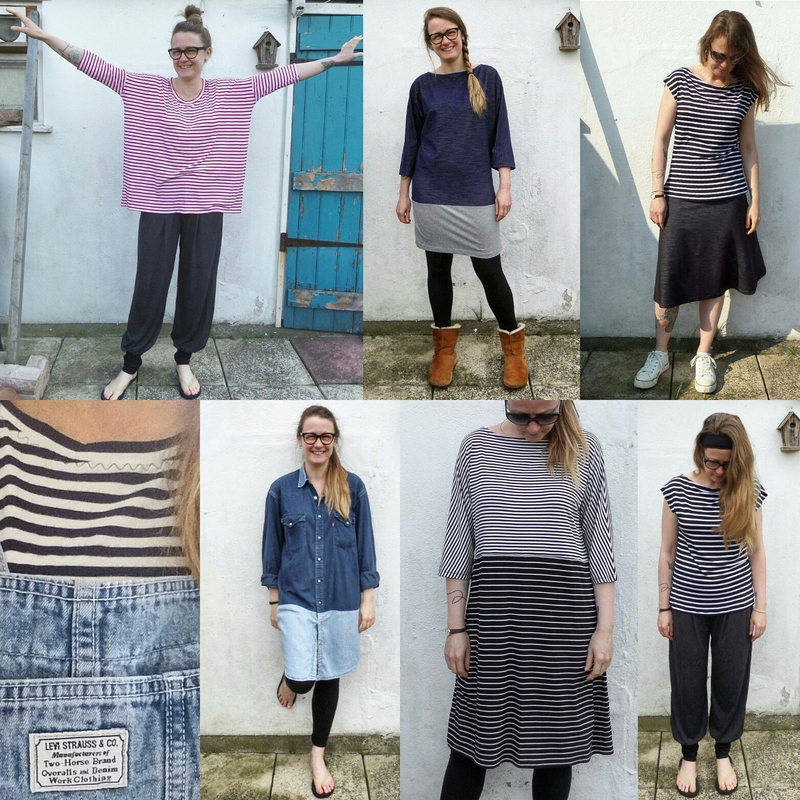 Got to love a good stripe even when they need matching at seams…..
Gloriously comfy cuffed version of the trousers from Beginner’s Guide to Dressmaking in heavy drapey viscose jersey and t-shirt version of a new pattern coming later this year (see a dress version of it in week 1). A colour blocked wearable toile in denim effect jersey and grey marl jersey of another new pattern that’s currently in development that will have a lot of versions. The more I work on this pattern, the more ways I come up with to make it. As a designer I love to really fully explore the potential of one pattern rather than constantly churning out new styles. I think this is heavily influenced by my experiences of working in the two extremes of the fashion industry, I wrote a bit about that here. A good old striped Walkley vest – a versatile wardrobe basic, teamed with an a-line version of the Tapton skirt in a heavy denim effect jersey. 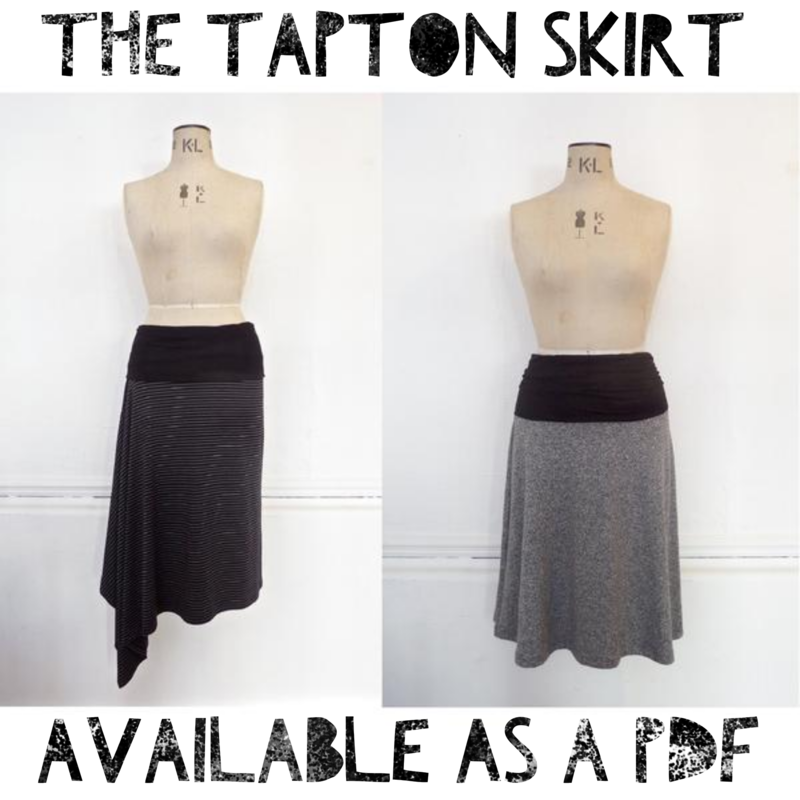 This skirt is so comfy and just so flattering, I can’t believe I don’t wear it more. It was nice to give my legs an airing that day too. A half fail this day – I only managed a me-made long sleeved top and vintage Levi’s dungarees as I spent most of the day climbing around in the MIY Workshop window installing a new exhibition of thread art by Brighton artist Michelle Abbott. My beloved and well-worn refashioned shirt dress that I made for last year’s The Refashioners and me-made leggings. A hacked version of the Fulwood dress with lengthened sleeves and the CF and CB pleats moved to the side seams in double stripe viscose jersey, super comfy. And those leggings again. Finally, that striped Walkey vest again, this time teamed with those super comfy trousers again from Beginner’s Guide to Dressmaking. Oh and me-made head/alice band. I was trying to be a bit more adventurous with my hair too last week and have started making some alice bands and pushed the boat out with a plait. I keep toying with the idea of a fringe, it happens occasionally. I find that if I don’t act on it the idea eventually goes away again! I’ve had one before and I do like them, but I’m just too hair-lazy to keep up with the maintenance they demand. Anyway, enough about hair, here’s to week 3!